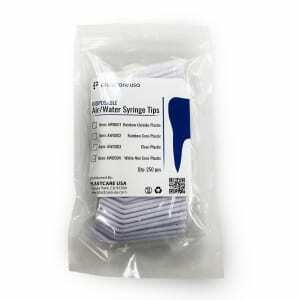 Making hard to reach areas of the mouth easier to access and clean, these Air Water Syringe Tips deliver water, or a mixture of air and water, to clean away debris and plaque buildup, very similar to the function of a Water Pik. A safer, healthier choice over difficult to clean metal syringes, these plastic syringe tips, which are disposable and should be discarded after use, eliminate the possibility of contaminant and bacterial build up often found in metal syringes. 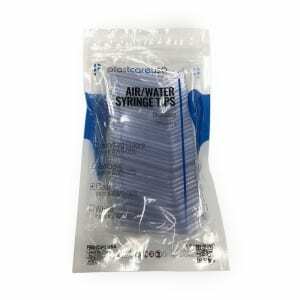 Individually wrapped, these pre-sanitized Air Water Syringe Tips are curved, allowing you to access difficult to reach areas of the mouth. 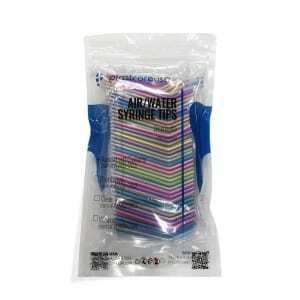 Choose from White, Clear, or Rainbow Air/Water Syringe tips.